For Hitler's viewpoint, see link at bottom. 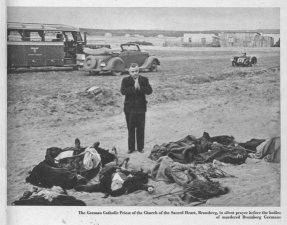 The historical record on Bromberg "Bloody Sunday" and related incidents -- 58,000 dead or missing by Feb 1940. The German invasion was Sep 1939, but it's important to understand that many of the outrages had preceded the German invasion. This was proved by the amount of decomposition of the bodies. Thus, these atrocities cannot be excused simply as reprisals for the German invasion (which would be wrong anyway). They included 19 year-old girls with their faces smashed, amputations, disembowelments, shot thru' the eye, death-trauma births, you name it. Poles had been merrily slaughtering anything or anybody German since at least as early as April 1939, with smaller incidents stretching back to the close of WW I -- you haven't been told that by the Mass Media, or the fact that these atrocities were one of the main causes for the German invasion of Poland, something that was meant by the Germans to be a local solution to a local problem. Germany had already done the "right thing" by protesting in writing to the League of Nations literally dozens of times. The League of Nations did nothing, yet the problem had to be solved. Subsequent to the German invasion, Britain declared war on Germany, yet after the Soviet Union invaded the eastern Polish territory only a few weeks later, Britain neglected to declare war on the Soviet Union. Why not, if the integrity of Poland's borders was so important? Inquiring minds want to know. [Well, Britain gave war guarantees to Poland stating that it was going to declare war on Germany should Germany move eastward. Britain didn't give any war guarantees to Poland against a possible Soviet invasion. FB.] After using these incidents as obvious pretext (the real purpose being to take down Germany as an economic rival and arch anti-NWO force), Britain then began bombing the Ruhr Valley the day after Churchill took office (May 10, 1940), specifically targeting civilian areas in addition to industrial and military targets. The rest is history -- a shameful and gut-wrenching one. On Bromberg Bloody Sunday, thousands of ethnic Germans were slaughtered like pigs in an alley because the majority "poles" (the "slavic", non-Teutonic types, really Turco-Ugaric, Hunnic, Tartar and Mongoloid residue from the old "Dark Age" invasions) knew they could do so with total impunity. Marshal Pilsudski had died, and Britain's leaders had made unconditional guarantees to Poland as a pretense to ensure maximum political tensions in Eastern Europe to serve the interests of Soviet Russia. Poles in official capacity were openly laying claim to ancient German territory, were engaging in the crudest pea-brained saber-rattling, had engaged in border violations and boasted of marching thru' the gates of Berlin in 3 weeks (or days, depending on which buzzing brain was indulging in the fantasy). Poland had even stolen a chunk of "Czechoslovak" territory in early '39. Few today weep for these innocent people. No Tom Brokaw pursing his lips over photos of them with a concerned expression, like he had just gulped a bushel of lemons. No Charles Kurrault telling folksy anecdotes about them, ending with "no, dear ones, we will not forget". No Richard D. Haffner, Ph.D. furrowing his professorial brow about them on his PBS talking head program. Nope, you'll see no paeans to these forgotten victims in our controlled, sycophantic media. These files will help to set the historical record straight by providing some balance. If you want the "official" version, just turn on your TV set, or go to a major bookstore. It's all there. "The [NATO] bombing war also violates and shreds the basic provisions of the United Nations Charter and other conventions and treaties; the attack on Yugoslavia constitutes the most brazen international aggression since the Nazis attacked Poland to prevent 'Polish atrocities' [his quotation marks] against Germans", says Walter J. Rockler, former prosecutor to the Nuremberg war crimes trials, in a letter to the Chicago Tribune, May 10, 1999. Well, Walter, pull up a chair and take a look at the evidence. This "pretext" will be the most concrete hallucination you will have ever had. You mean to tell me you really didn't know about this? Awww, c'mon Walt . . . So look now at material you will have a tough time finding in your local library, or anywhere else for that matter . 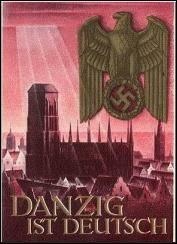 . .
One day, Dr. Brandt, one day Danzig shall be ours!!! Last edited by friedrich braun; Friday, November 21st, 2003 at 08:37 AM. We will hang up the same poster, which the the polaks did in 1945, calling us to leave the land or face the consequences. It shall be the exact same translation, only the word "German" will be replaced by "Pole". A copy of the original will be placed in the corner of the poster, so they can see the original text and will understand that they are just getting back what they once inflicted upon us. PS: I know that link you posted. It's very good! I also have the original book. There was also a repring of it made in the 90ys, available at ARNDT-Verlag. That is purely ridiculous. First of all every country involved ina war up until much later than WWII considered it quite acceptable to reduce the civilian population with ethnicities of the country you are at war with. Especially one where, for all the people knew wanted them dead simply because they spoke a different language. The closest germans ever did for welcoming poles into germany up until that point would have been taking us in as slaves. Note: Not in any way meaning to start trouble on the nordicist forum, however having a Polish background you can understand why I would like to make a remark on this. Polish Atrocities Against Germans Before WW2?